Dungeon of Signs: What do you want to see on Dungeon of Signs? What do you want to see on Dungeon of Signs? This blog has been about for a while now and I'm curious about my reading public so there's a poll upon the side of the Dungeon of Signs main page about what sort of thing you enjoy reading. I'm not saying it'll effect my writing, but I guess any response from readers is encouragement. If you want something that isn't on the list let me know in the comments below. 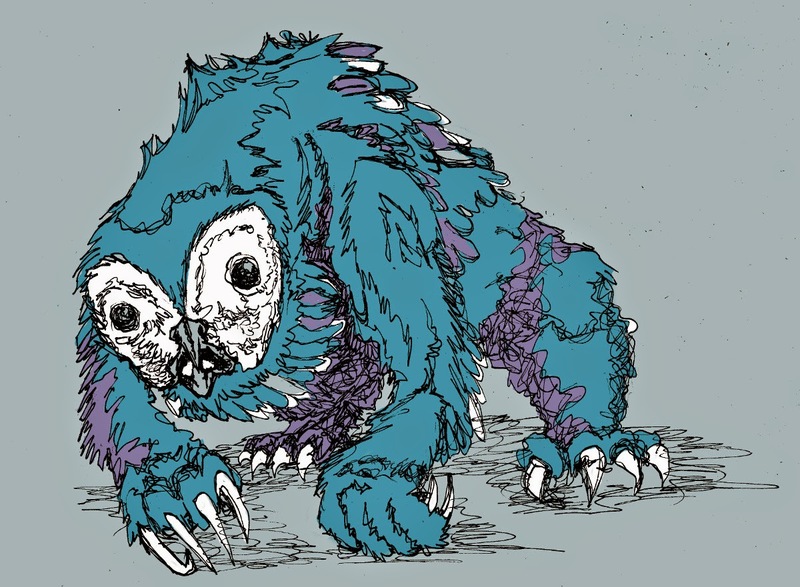 Also above is a drawing of an Owlbear for the Fallen Empire adventure I am (very slowly) plugging away at. Hah, I am going to be unhelpful and vote for 4/5 of the options. Cannot decide! I came here for the HMS stuff, stayed for all the rest. I'd love for you to revisit the Underdark. I adapted your prisoners in Gloomlight setting for a campaign and I'm using some Veins of the Earth rules from False Machine, so I'd definitely welcome some more material of that sort! A major factor in this question is: which ones do you have the most fun writing? All of them are good with me, if they are what you want to do. I'm probably most interested in the HMS Apollyon setting stuff, but I wouldn't want you to give up doing the other stuff. I like everything you do man. Further demands... Finish "Tomb of the Rocket Men", perhaps some compilations offered on the cheap on LULU (I have cold hard cash to keep you motivated) and just keep writing. Anything owl bear related is good for me. Description: the temple gate tavern erupts into flames just past midnight, it is several hours before sun up before the flames are extinguished. DM advisory: the fire emerged from a stone well in the tavern Cellar. The well drops down into an ancient city ruins below the existing town. The tavern owner ignited some flamable gas while exploring his prize. Explorers require a create air spell or they must save vs poison once per turn until dead. Just keep doing your magic, man. Your stuff is among the best in the blogsphere. That said, I find the Fallen Empire setting very intriguing and I look forward for every bit of it. I think the most valuable are the reviews - its nice to see some critical reviews of OSR adventures that aren't written by a dillweed. I read everything you write. Just keep writing. I enjoy your writing, too. My favorite is your particular style of reviewing classic modules - not all of which you've reviewed yet - where you go beyond reviewing what's good and bad, to explore how best to improve the module's broken bits. I've found that extraordinarily insightful and helpful. I have some players who never got to play through the classic modules, so I'm doing that now, with upgrades where suitable. You're one of my main sources for what to fix and how. Thanks for all the great analyses.